Frameless design preferred by many architects. Architects asked for it, so we made it. 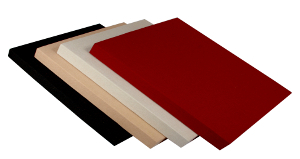 ATS Hardened-Edge Acoustic Panels take the guesswork out of purchasing acoustic panels for commercial buildings. Nobody likes surprises during new construction or remodeling, so we built Hardened-Edge Acoustic Panels to conform to the industry specifications and standards most commonly used by architects, ensuring that you know exactly what to expect. 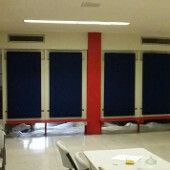 ATS Hardened-Edge Acoustic Panels have no internal frame, making them lightweight and suitable for multiple mounting techniques. The construction and integrity of frameless panels starts with a rigid fiberglass core (6 pounds per cubic foot density), which is extremely effective at absorbing sound. Fabric is tightly and evenly stretched around the core to prevent any visual imperfections such as puckers or wrinkles. Borders are treated to form hard, impact-resistant edges. All ATS Acoustic Panels are handcrafted in the USA to ensure the highest quality construction. On a scale of 0 (perfect reflection) to 1 (perfect absorption), the Noise Reduction Coefficient (NRC) of our 2-inch fiberglass core is .95. This rating represents exceptional sound absorption (95%) and the need for fewer panels—an economical and space-saving choice. We offer a first-rate fabric that not only looks stunning, but also lets sound pass through easily to the absorbent core. The fabric is available in a range of colors to complement any décor. Guilford of Maine is tried-and-true—the industry standard in acoustic fabric; the only thing you have to worry about is picking the perfect color. American Society for Testing and Materials (ASTM) E84 Class A fire rating offers you peace of mind. Commercial-grade polyester is expertly woven for a smooth, uniform finish—a smart choice for professional spaces or sleek, modern designs. Polyester doesn’t absorb moisture, making it well-suited for high-humidity environments. Acoustic Panels should facilitate exceptional sound quality in your space and look amazing while doing it. We’ve got you covered. Creating frameless panels is a precise way to make a visual edge, creating crisp, straight lines. This look is perfect for any application and particularly complements modern décor, upscale homes, and professional settings. Hardened-Edge Acoustic Panels are available in 1”, 2" and custom 4” depths—the 1” panels offer our slimmest silhouette. Designers and homeowners will delight in our array of options: combine sizes and colors to create a unique, visually stunning look. If you can’t make your dream design with our stock selection, we offer custom shapes and sizes built to your specifications. The possibilities are endless.